So the next thing I wanted to cross off my snow to-do list was to make a snowman or something. I went with a bear which I figured you'd appreciate. It's smaller than I wanted it but this was my first time working in the medium of snow. Love the polar bear...you did very well w/ snow, it being your first time! looks cold out there! making my EYES TEAR UP, Jorge !! not really :)) ... but creative ! I appreciate it :) No snow where I live in New Zealand and the polar bear is a nice touch. Happy New Year. Oh that's more fun than you know!!! Second - my daughter (13) is standing over my shoulder... she said "oh my gosh! That's not Nunu in there is it???!!!" I assured her - it was not! "He's crying for the environment." Amazing, I literally cracked up sitting at my computer. I got Lost Season 5 for Christmas and am finishing it in preparation for season 6 - can't wait for more Hurley moments!! "In the medium of snow" - heh heh, I like that! Looks good - you have a backup profession! You don't know me, but I have been enjoying your blog for a few months now - love all the fun photos! LOVE IT! So cute and creative! I could build smth like that in the snow, too. Maybe I should try but I hope my one wonÄt cry! I was so glad when we found out why there were polar bears on the island. I giggled when they had one on the pilot, then never really touched on it after that. At first I just figured the writers thought it was a lame idea, and to just forget about it. I like your polar bear. Way "cool". hehe.....Less than a month till Lost. Hoor-freaking-ay:)!!! It looks like the rest of the bear is on your hood. That's a good, practical coat for Hawaii! Seriously cute. I don't think I'll ever make a snowman again. It's snow bears from here on out. I just need it to stop raining. All the best in 2010 bud! That's a totally cool snow bear! I liiike it! thanks for sharing...it's always fun to stop by and visit your blog. Excellent! Thank you for sharing! I tried to make a snowman in my mams garden today with my little boy Oscar. We nearly had the body section completed when I noticed it had a great big cat poo sticking out of the top. It was all over my hands as well...Gross. Luckily Oscar didn't get any on him, but I'd had enough by then...It was the worlds worst snowman making experience! who knew you were so artistic!! Awesome job for your first time!! And, yes, I DID appreciate that you made a polar bear! That's so funny! What are the chances you would build a Dharma bear just for us fans? You're Polar Bear snowman is amazing! LOOK! LOOK WHO'S IN MY PROFILE PIC WITH ME! MET HIM IN NY! Awesome polar bear! He's crying for the environment? Speaks for the polar caps, like the lorax speaks for the trees! what a cute little bear...you ..look like nanook of teh north. This should be in Al Gore's next movie! Too funny!! Cant afford it but you could Jorge and post some photos! Oh, no! IT IS THE POLAR BEAR! He's so realistic - great proportions! I am very impressed! I have been playing in the snow my whole life (31 years) and I can't come close to something that awesome! next time, can you build some deranged, Calvin - style snow men? Awww a polar bear with a message. Great polar bear, aha. It looks dead hard to make! It's snowing a lot over here, so I made a snowman with my sister which just blew over with the wind. Spent ages on it and all! Your Snow Bear looks great, Jorge! Thanks for sharing the pic and vid of it with us! You should be a sculptor! Hope you've thawed out there in Hawaii since your visit to the land of snow and ice! Hey the little guy looks great! We hav snow here every year but i'm not able to build something like that! Respect! Your talents are neverending. You have one lucky girlfriend. 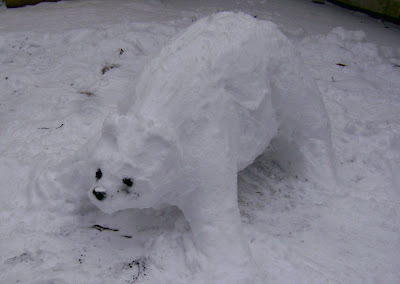 Good job on the bear- I could never sculpt anything from snow...speaking of polar bears, I came across this & thought I'd share in case you hadn't seen it yet. i am so glad you played in the snow and are sharing pics! love the polar bear!! Magnifico! It looks like a polar bear you would see in NWT!!! Haha. "His mascara's running." Hilarious. But seriously... that's a pretty darn great snow sculpture! wow. that's really awesome! i can't believe it's your first time making something in the snow. that bear is excellent! Oh great! A polar bear!!! Fantastic! Jorgeman have a great talent for sculpture. Runny mascara? Must be Tammy Faye Bearker. Wow! I thought your pumpkins were creative, now you're making polar bears from snow...You are definitely a man of many talents! OMG that is the cutest idea ever! you did such a good job. Where's his Dharma collar? I LOVE the idea of a polar bear! So cool... you are an artist!! Come back to California it was 75'F today. But then you must be back in Hawaii by now right? put up my new LOST calendar today and guess who is pictured for August my birthday month? Wow! Great job! How do people make these amazing snow creations? :D Awesome job its fantastic! he's got so much character in his face. It's a shame he eventually has to melt! I made a giant fish the other day - you reminded me of it. Here's a pic. Nice polar bear!